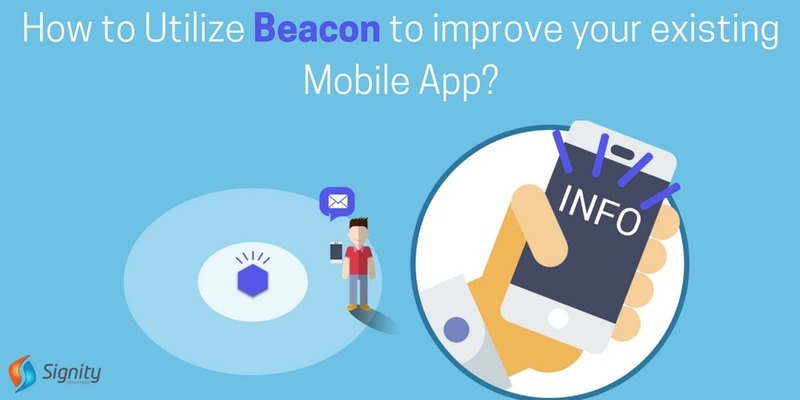 How to Utilize Beacon to improve your existing Mobile App? Beacons captured quite a few headlines since 2013 when they were first introduced by Apple as iBeacon Technology. Though it took some time for them to attract the masses but now we can say that the time for Beacon has come. Beacons are now being used everywhere. From retail to eCommerce, all of them have started to feel the heat and have Beaconified themselves. However, before we jump into utilizing Beacon to improve the existing Mobile App, let’s see What Beacons actually are? How do they look? How can they be used? What are Beacons or iBeacon? iBeacon Technology was first introduced by Apple in 2013 and due to its jaw-dropping features, it started to attract Android Giants as well.In the year 2015, Google couldn’t ignore iBeacon’s amazingness and came out with Eddystone, their iBeacon alternative.To put it in layman language, “A beacon is a small Bluetooth radio transmitter”. A Beacon keeps on transmitting radio signals than being seen by other devices. A device that has Bluetooth can identify and catch a Beacon once it’s in range. Beacons are also called as BLE Beacons where BLE stands for Bluetooth Low Energy. Beacons are very small and simple devices. They comprise of CPU, radio, and batteries. They use small lithium chip batteries or can be run using USB plugs. There are different shapes and colors of Beacons but all of them perform their primary task of transmitting signals effortlessly. How can Beacons be used? • Delivery Tracking: This is one of the beacons’ most important features. It allows its user to track almost everything that he can. In logistics, restaurant, grocery business, managers usually require finding out about the exact location of their delivery. By just attaching beacons, they can get the whereabouts effortlessly. Not just that, the track of the previous week, in fact, previous month’s delivery can also be stored for perusal. • Indoor Navigation: When we talk about Navigation, the first name that prompts our brain is Google Maps. Google Map tells us about the Outdoor Navigation but what about “Indoor Navigation”? That’s where these beacons come handy. Beacons can tell you about your whereabouts like where you are and where you’re going. For a movie, airport or wherever. • Automated Triggers: Beacons can make reactions automated and trigger events. You want your television to auto-start as soon as you enter the room. You want the Meeting Room Projector to flash upon your arrival. These are only a few possibilities; you can imagine anything and Beacons perform almost everything. • Data Analysis: Any company’s hugest asset is Data. Data can be generated, iterated and analyzed. Beacons perform all three operations. Beacons generate data on whereabouts of customers, what customers are buying, where is the delivery guy, what are my stocks. Based on the stored information or data, Beacons analyze everything. Beacons can give you a very detailed analysis of how your business is doing and where do you need improvement. Beacons have arrived and have arrived rollickingly. There are so many ways in which they are going to help your business. From tracking to user interaction, from security to Data Analysis, they are going to provide everything. Amazingly, you can integrate Beacons with your already running Mobile App. What are you waiting for now? Integrate your Mobile App with Beacons quickly for magnifying your business. Want to Beaconify your Mobile App and Business or are looking for a custom mobile app solution that is quick-to-market,just drop us a line at sales@signitysolutions.com and we’d be happy to help!